Hello thanks for the add. 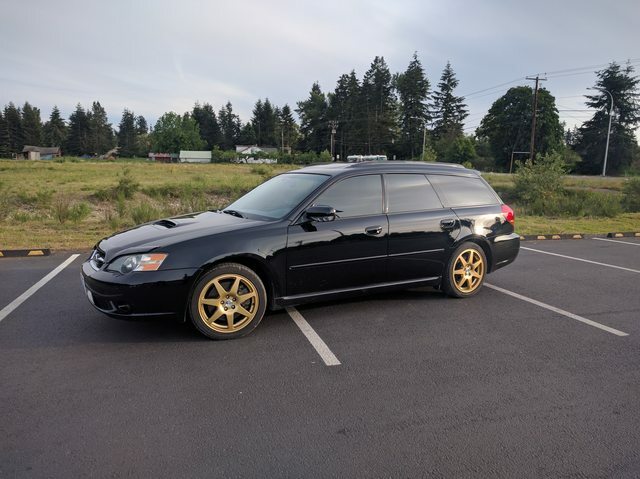 I have now got two legacy one wagon and one sedan. The sedan is a turbo car, and the wagon is a 2.2 LSI from US. And this i just have bought one turbo donor car from. So i am soon ready to start convert the car over til turbo. Also i have a 92 svx. Wonderful! Welcome to the forums! Form the turbo car, but i just woundring about these key. Are this keyless entry? I have some ir conector on the door also. Thanks some one know what batteri goes in it? The keys just have a small green light in them. This page in the owner's manual (bottom left) will have the info you need. That one's different than my LED light key, Josh. Yeah, it does look different but it may take the same battery. I'd just open up the key and see what's in there. Replace the old battery with a new one of the same kind. What I am getting at, is what if that's the elusive IR keyless entry unit that certain foreign market 1st gens got? OP, lets see when you replace the battery if it works for your turbo! 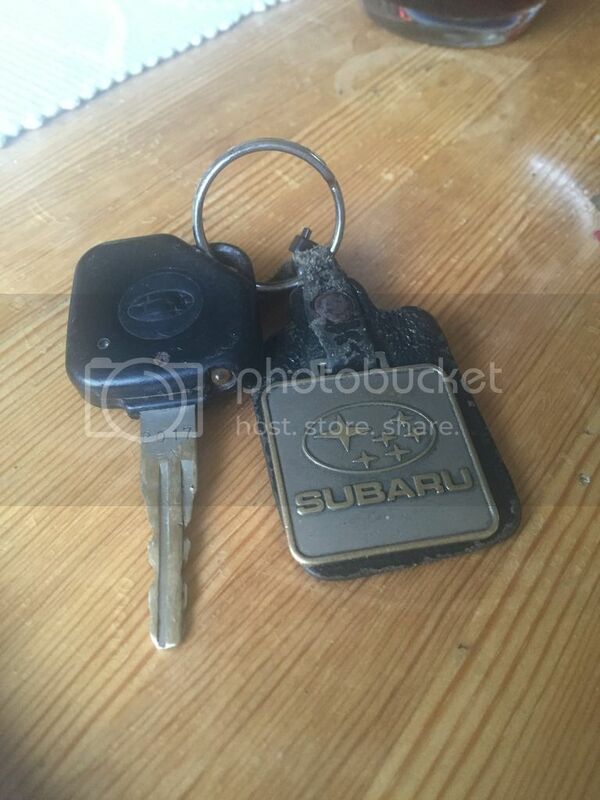 You can tell it's a car's original supplied key because it has the lock code stamped on it! When you get a replacement, they don't stamp them again. I was not aware of an elusive IR keyless entry system. If there's not a button anywhere on the key to turn the light on then yes it probably is part of that IR keyless entry system. There's more detail in the troubleshooting section in that same FSM. 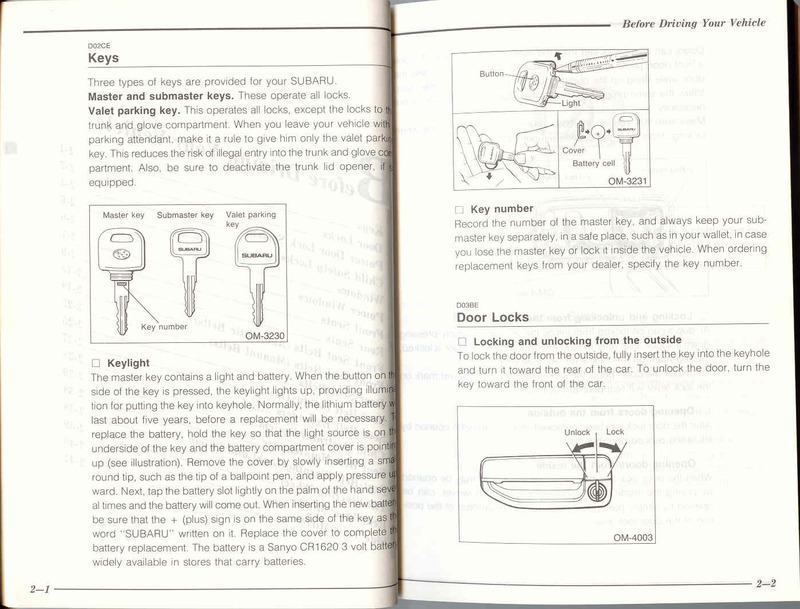 To me, that key fob looks *just* like the diagram. The regular led light fob looks slightly different. I would agree, that key looks exactly like that one in the manual. Yes, that key is for the IR keyless entry system. Very cool! I dont have the manual for the legacy, it have been imported from Germany to Norway. So the car have travle a long way hehe. Where can i post a topick on my turbo swap prosjekt? Is it a general post or question or are you wanting to start a journal of the work type of post?